Ken Ludwig, author of LEND ME A TENOR and numerous other hit comedies) takes a very broad leap from Arthur Conan Doyle’s 1902 THE HOUND OF THE BASKERVILLES as he turns it into a snappy comic mystery with five actors performing nearly 40 roles. Sherlock Holmes, along with Dr. Watson, is called into a case involving the male heirs of the Baskerville line who are being murdered one by one. 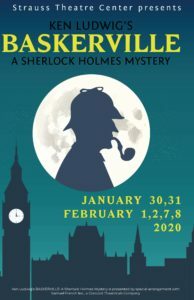 Will Holmes solve the baffling case before, Henry Baskerville, the next male heir who arrives from Texas, is also murdered?